Working at Colostomy UK is sometimes like spinning plates. No two days are the same and in a single day you would probably be surprised by the amount of projects, campaigns and queries we are working on. So when in the midst of another hectic week our lovely volunteer Jackie asked: “Would you like to come to our chair yoga session?”, it sounded just what I needed! I’ve never done yoga before. Yoga has only ever been recommended to me by people who would talk about “inner peace” and strengthening something called my “core” all of which sounded a bit wishy washy to me. A quick look online sprung up many images of people with their legs behind their heads stretching in front of sunrises. If I were to attempt a downward dog I suspect rather than finding inner peace I’d be in pieces. It’s safe to say that chair yoga is a bit more accessible than this. The session took place at Edwin’s Hawk Community Centre which is a stone’s throw away from the train station and was carried out through Jackie’s support group: The East Berkshire Ostomy Club. 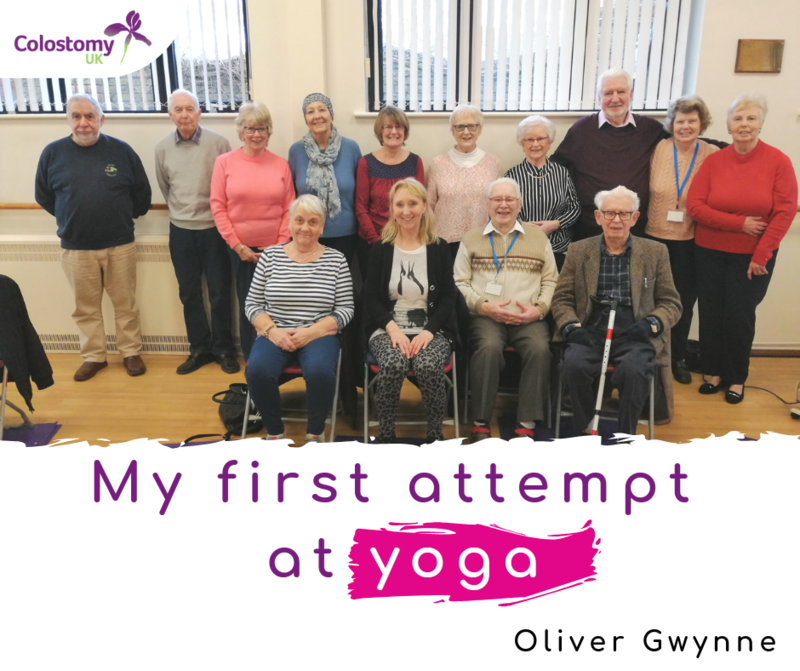 Chair yoga is just one of the activities that is carried out through our ‘Active Ostomates’ project. We give support groups ‘taster’ sessions in everything from archery and swimming (not together!) to yoga. The idea is once you try these activities with your support group you will have more confidence to do them elsewhere. It’s also a great way for new people to get involved. The chap I sat next to, Neville, told me he had had a urostomy for over 20 years. Until recently he had never felt the need to join a support group, but came along because he wanted to try the chair yoga. Since then he has become a regular because, yoga aside, he has found the tips, advice and company so good. The group themselves were no novices to chair yoga and had done a few sessions in the past. I warned them that they mustn’t show me up! The session was led by the brilliant Judy Alexander, who took things very steady throughout and peppered the session with interesting little stories and recent news on wellbeing. One thing she also talked about was JOMO or Joy Of Missing Out. Intrigued? In essence it’s all about remembering the importance of giving ourselves permission to just sit and do nothing which, of course, is something that is increasingly difficult to do in an ever-connected world. As I sat there with tranquil music playing I certainly bought into this theory and its benefits! After an hour the session came to a close and apart from confusing my left from my right more times than I would like to admit, I found it enjoyable. The sessions are certainly simple enough that anyone can come and join in, but they are far from being an ‘old person’s thing’. Any one of any age or ability could come along and get something from it. If you are an ostomate, or a friend/family/carer then chair yoga might be a good opportunity to introduce yourself to your local support group. We run the sessions all over the country and they are free to attend. You don’t have to be a member to give it a go.